This is the 3rd „commercial“ software to control your analog CV and gates with – after Stretta showed off his solution to control his modulars by using the DC offset of his audio interface instead of a dedicated MIDI-CV interface to get higher resolutions. 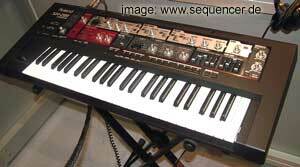 later Motu (the only interfaces that have DC offset without hardware modification) released Volta. And after that, Silent Way by Expert Sleepers put out not only plug ins but also hardware helpers for non-DC-offset-interfaces like RME etc. So there you get the ES Module Series – that allow to use optical ADAT and other solutions. and here’s CV Toolkit. It’s in between the solution of the rather minimal Volta and those pretty large amounts of plugins by Expert Sleepers. – CV Toolkit http://www.youtube.com/watch?v=m9jAy5H38hs#t=113 can control any modular incl EMS and other non- 1V/Oct.-Synths. 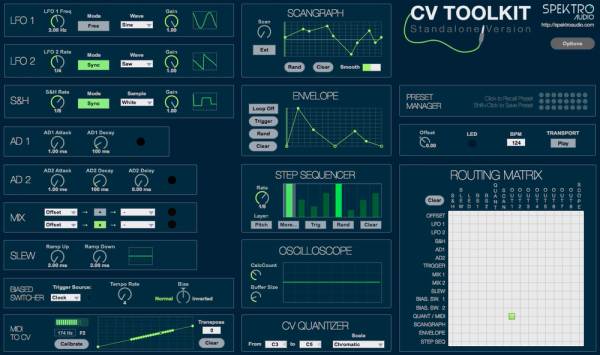 it also has Envelopes, LFOs and other things to be sent to the modular, replaces or saves some hardware modules, then..
CV Toolkit – Standalone Version 1.1 update is out! — Spektro Audio.